While the foldable hardware shown at this year's Samsung Developers Conference has quickly garnered headlines, the new direction that Samsung are set to go with their software is perhaps the more meaningful development. Though the company also used the keynote of its developer conference to talk about new third-party add-ons for Bixby and a redesigned SmartThings Developer Workspace, the most significant software announcement here is the impending arrival of One UI. 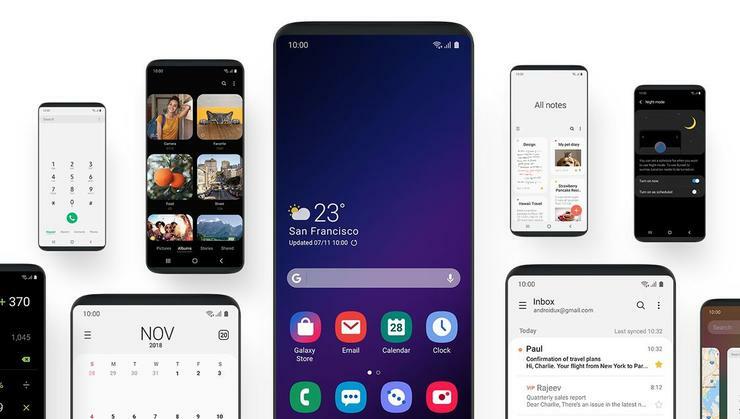 According to the company, the software experience for their Android devices has now been "reengineered to reduce clutter and distractions, allowing the user to better focus and quickly navigate their phone." Where the transition from TouchWiz to Grace UX was one designed to make the software experience on Samsung's Galaxy smartphones more cohesive, inutitive and visually appealing, this new move from Grace UX to One UI is more about ergonomics, usability and reducing the repetitive strain of using larger phones. After all, smartphone displays are only getting bigger and bigger, and one-handed use of them is becoming less and less viable - not to mention uncomfortable. Samsung say that One UI is intended to remedy this situation and enable a software experience that's a more ergonomic to use than Android currently is. It'd be fair to say that Google themselves have started responding to this problem via Android Pie's gesture controls but Samsung's vision of reworked interface across all of their smartphones and tablets looks to take things much further. Most Samsung apps have now been redesigned to privilege the lower half of the display for buttons and other touch interactions. Meanwhile, the upper part of the screen has been designated a 'viewing area'. There's also a new dedicated night mode that spans the entire operating system. What's more, unlike the foldable concept phone that Samsung showed off during the event, there's a clear date for when this software upgrade will actually arrive for consumers: January 2019. That's when Samsung say the One UI software upgrade will arrive for Samsung Galaxy S9, S9+ and Note 9 devices. No word yet on whether, nor which, older phones might also receive the update. However, an overhauled software experience that's a better match for the software on Google's Pixel phones could serve to make Samsung a considerably more appealing option for customers across the flagship, mid-tier and budget markets. Ahead of the rollout, there will also be an open beta for Samsung users in the US, Germany, Korea and several other regions. No word on whether Australia will be one of those regions.